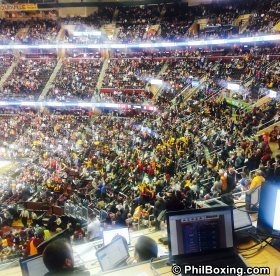 CLEVELAND -- It's one of the loudest, wildest arenas in the NBA. It's called the Quicken Loans Arena or simply the Q. It is the official home of the Cleveland Cavaliers. PhilBoxing paid a visit to this arena jewel in the Midwest yesterday when LeBron James and his Cavaliers recently hosted Derrick Rose and the stampeding Chicago Bulls. 60 points to dent Chicago's vaunted defense. 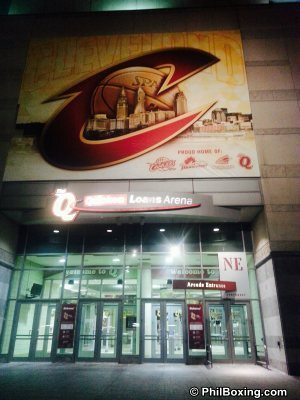 Formerly known as the Gund Arena, the Q opened in October 17, 1994 at the cost of $100 million, although it has since been renovated by new owner and billionaire Dan Gilbert. Among the Q's salient features is an HD scoreboard jumbotron, the largest among all NBA affiliated arenas, according to Wikipedia. 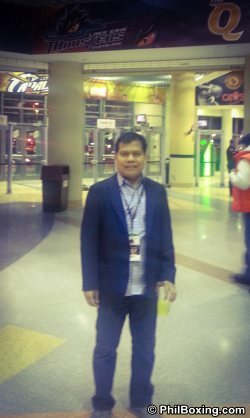 The author poses at The Q during the Cavaliers vs Bulls NBA game on Monday, Jan 19. The Q is a multi-purpose arena that hosts concerts, shows and other sporting events. But its biggest .lure is LeBron James, today's foremost basketball player, who routinely draws a sell-out crowd of 20,562 fans each time he suits up to play. It was no different last Monday night (Tuesday morning in Manila) when the Cavs dueled with the Bulls. 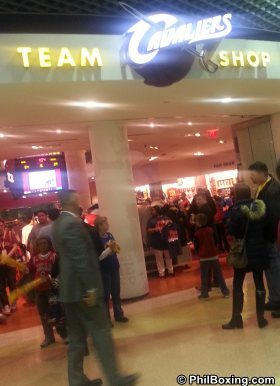 The Q rolled and rollicked under the screams of loyal Cavs fans as they watched their beloved team chalk its third consecutive win, a streak that followed six consecutive losses. Click here to view a list of other articles written by Homer D. Sayson.